North Carolina school suspensions and expulsions cost the state’s students about a million days of classroom instruction in the 2015-2016 school year, a new report from the Southern Coalition for Social Justice’s Youth Justice Project finds. The new report is part of a growing body of evidence questioning long-running disciplinary practices in the state’s public schools, particularly in their well-documented disproportionate impact on North Carolina’s black students. Among the interesting points in the new report: Long-term suspensions and expulsions are on the decline in the state’s schools, although in-school and short-term suspensions are rising in number. 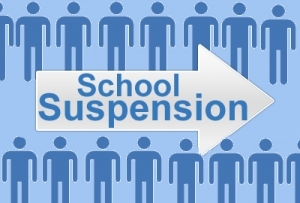 Meanwhile, the average length of suspension has been on the rise in each of the last three years, and African American students continue to receive far more than their share of schools’ stiffest punishments. Policy Watch has been reporting on the discrepancies in schools’ disciplinary practices in recent years, while state lawmakers and K-12 leaders publicly urged a reduction in school punishments. Some have suggested cultural differences may be playing a pivotal role in the disproportionate punishments for black students, prompting calls for greater teacher training. The authors of this week’s report contend that the state’s public schools simply lack the resources to address the problem. Students can be suspended for small infractions, such as chewing gum in class or a cell phone ringing. In some cases, problems that used to be resolved in the principal’s office go straight to our court system. Court referrals negatively impact North Carolina youth who live in the only state that charges 16- and 17-year-olds as adults for all crimes, regardless of the offense. Prosecuting youth as adults leads to a lifelong criminal record and adult consequences for children who have not yet finished growing up. This response can also have devastating impacts on certain student populations. For example, male students, African American students, and students with disabilities are disproportionately suspended and expelled, as well as reassigned to Alternative Learning Programs. Unfortunately, it is difficult to learn more about how students’ identities may impact suspension decisions as North Carolina Public Schools’ published data is limited in terms of disaggregated data on offense, socio-economic status, and race. Here’s a fact sheet on the report’s findings.